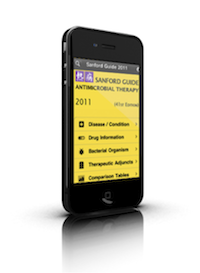 The Sanford Guide is a classic antibiotic and infectious disease reference that is now available on the iPhone. Antibiotic suggestions are available by infection type and microbe, making this a high value clinical application. A must have for medical students, residents, and attending physicians that use antibiotics on a routine basis. The citations of primary medical literature also make the Sanford Guide highly useful in educational settings. The high clinical value of the Sanford Guide is reflected by consistently high rankings in the iTunes App Store for Top Grossing Medical Apps. A new version of the Sanford Guide, updated for 2012, will be released in the near future.